We are stand-alone Linux powered Web Servers based in Adelaide, South Australia. 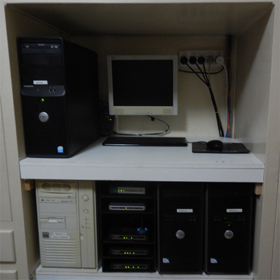 First set-up in the year 2000, we have been in continuous operation since then providing Family History Resources and Free Hosting for those who wish to get their History Project Online. We are self-funded by Advertising income from our main and associated domains, which includes purchase of all Plant and Equipment. We accept client based or affiliate type advertising, but prefer it to be related to our Historical Outlook. This gives our clients possible exposure to in excess of 100,000 pageviews a month. We are also currently providing Private Web Storage Space for clients, who request it as long as it is History Related. This all started as a shared Hobby for Peter Applebee, that of Family History Research and Computers. The first computer was purchased in about 1990 to keep track of his Family History. By 2000 the Internet was all the rage, and it was only natural that he was to follow suit. The Ozgenonline.com domain was purchased as was the first fixed IP address. From the first little Pentium twin CPU P200, we have upgraded a couple of times and currently use mainly Dell or Custom Built Equipment. After a Hacking incident in the mid 2000's, he installed Network Gateway Servers to protect this Network. Today's configuration consists of 2 Web Servers and 2 Network Gateway Servers, plus all the standard network peripherals. In 2001 a Project was started to try and document Australia's Cemeteries as a free online resource and Australian Cemeteries Web Site was born and hosted on the Ozgenonline servers. By 2009 the traffic to this website was such that all the bandwidth was being used, bringing site access to a near standstill. Something had to be done. A decision had to be made to acquire on some commercial hosting space and the Cemetery site was shifted to a new domain at Australiancemeteries.com. For the first time selective Advertising was allowed on the sites to cover the overall running costs. This proved to be the correct move with traffic more than tripling and size has doubled since then to about 6 gigabytes and 55,000 files currently available. However this does not include the selective cemetery data provided by Individuals who chose to do their own website and have them hosted by the Ozgenonline Servers. Carols Headstone Photographs joins OzGenOnline We are happy to announce that Carol Judkins has moved her wonderfull headstone photo site to our Server, after having issues with the Rootsweb Hosting Service over recent weeks. We are only to pleased to offer her Web Space and welcome her to OzGenOnline Family. Neil Mansfield working on more cemeteries. Neil recently completed Kilmore Catholic Cemetery with full support of the Cemertery Trust. He will soon be transfering five more Victorian Cemeteries previously hosted on the now closed Vicnet Community Host. Coming soon are Dargo, Glenmaggie, Gormandale, Stratford and Toongabbie Cemeteries.